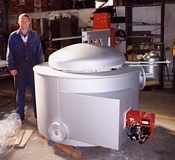 The range starts from a small 1 litre bench top furnace up to the large 400 litre capacity furnace. The furnace can electrically heated, gas or oil fired. The furnace heats around the crucible to ensure good temperature uniformity of the melt. The high grade insulation in the furnace results in low casing temperature, energy efficiency and long life. The furnace floor is sloped to an emergency run-out port minimising damage to the furnace in the event of crucible damage. Temperature control system monitors both the chamber and melt to prevent thermal cycling.